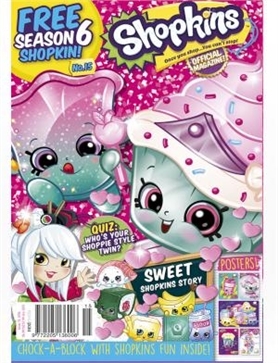 Shopkins #15 - MyMagazines - Subscribe online and save. This issue of Shopkins magazine is chock-a-block with Shopkins fun inside! Discover who your Shoppies style twin is with our cool quiz, make your own Shopkins notebook and try out the delicious Chef Club recipes. You’ll also find fun facts, puzzles and awesome posters inside!